VANCOUVER, British Columbia, March 14, 2019 /PRNewswire/ — Freightera, a leading freight shipping marketplace offering instant freight quotes and online shipment bookings in North America, was recognized as a top private company in the ICT category by Rocket Builders. Selected from hundreds of companies evaluated in the “2019 Ready to Rocket” category, Freightera was recognized for its impressive market traction and revenue growth to date, as well as future growth potential. “Each year when we choose the Ready to Rocket companies, we are looking for those companies that leverage the latest trends and offer a unique, compelling value proposition. Freightera is an excellent example of a company taking key steps toward achieving its commercial potential,” said Geoffrey Hansen, Managing Partner, Rocket Builders. 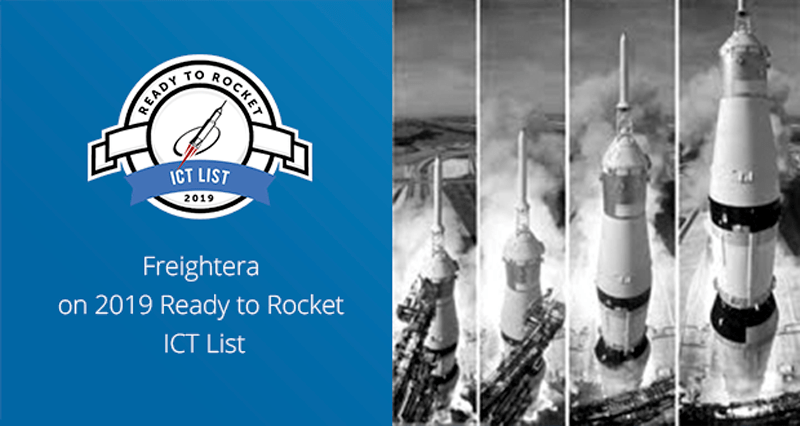 Ready to Rocket Recognition Lists have been published for multiple technology sectors since 2011. “Ready to Rocket” companies have a clearly established base of initial customers, rapidly increasing headcount and revenue. The selection committee was looking for companies that have the potential for 50 percent to 100 percent growth in the coming year and are in good position to leverage industry trends or key industry partnerships. Freightera’s current user base is over 9,400 business shippers, 800 carriers and over 1,900 revenue producing accounts. 2019 revenue is projected at over $15M, up 280 percent from $5.3M in 2018. Freightera’s customers are manufacturers, wholesalers, distributors, and other business that regularly ship freight in Canada, U.S. and cross-border. The company is famous for its highly competitive pricing, exceptional service and the platform’s ease of use. Freightera’s customers save over 50 percent in shipping costs and a huge amount of time they would otherwise spend on getting and negotiating prices with carriers and brokers. Over 150 customers evaluated Freightera in their online reviews as a best-priced 5-star service company. Many aspects are unique about Freightera, but perhaps the most important one is Freightera’s mission to reduce emissions from freight transportation. Freightera is the only freight marketplace company in North America offering low-emission freight services including rail shipping. Freightera CEO Eric Beckwitt is an author and passionate speaker promoting green freight solutions and technologies. Earlier this year, Frost & Sullivan, a global market research and analysis firm, placed Freightera among five ‘Key Automated On-Demand Brokerage Solutions in North America’ along with Uber Freight and Convoy in their “Global Digital Freight Brokerage Market Opportunities, Forecast to 2025.” Freightera was also identified for its high growth potential globally. Freightera is creating a unified global marketplace for freight shipping. Starting in North America, Freightera is automating freight transportation and increasing operating margins for carriers and businesses shipping freight. Freightera creates partnerships and systems and promotes new technologies that allow businesses to find the best price and lowest-emission transportation options. Over 9,400 manufacturers, distributors, wholesalers and retailers in the U.S. and Canada use Freightera for 24/7 online access to billions of all-inclusive freight rates and instant freight booking. For more information, see freightera.com. Ready to Rocket is a unique business recognition list that profiles technology companies with the greatest potential for growth. Each year, based on analysis of trends that will drive growth in the Clean Technology sector, Rocket Builders identifies the top private companies that are best positioned to capitalize on the trends for growth. This selection methodology has been an accurate predictor of growth with “Ready to Rocket” companies exceeding industry averages for revenue, employee and investment growth.